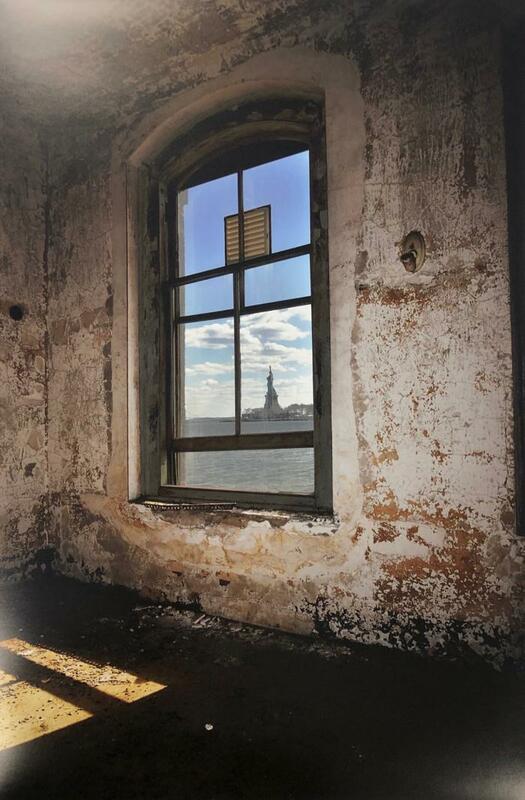 Colored photographs from the inside of a building at Ellis Island looking out a window at the Statue of Liberty. Those who were critically ill would be sent to an isolation ward where they might have been too weak to express anger, but likely harbored guilt, frustration, emptiness, and defeat. Just twenty-nine seconds and then the sentence. For some it would be death. But for others who had traveled great distances, they would hang onto the hope that they could conquer the illness and enter this new society, as they hung on to the “American Dream.” Indeed, Lady Liberty stood tall beckoning them outside the window, luring them into a space of hope that had propelled them to seek this new life. Freedom was close, yet so far away.